Pamela Drayton knows just how bad Rikers Island is. First as a corrections officer there and later, as the mother of an inmate, she has seen the abuse and the antiquated conditions at the jail first-hand. Drayton, director of public safety and facilities at the Craig Newmark Graduate School of Journalism at CUNY, and her son Lamont, are featured in “After Rikers: Justice by Design.” The film by Public Square Media looks at the movement to close it for good and replace it with more humane facilities around the city. After years of exposes and a U.S. Department of Justice report on the deplorable conditions at Rikers, New York City Mayor Bill De Blasio vowed in 2017 to shut it down and replace its eight jails with four smaller and more modern borough-based jails. Last year, the city launched a major study to plan and design the next generation of community-based jails as part of a larger reform of the criminal justice system aimed at reducing the number of incarcerated. Drayton says it couldn’t come too soon. As a corrections officer at Rikers for three years in the early 1980s, she saw what the environment did not only to the inmates but to those who worked there. That inside knowledge made it even more painful years later when she returned as a mother to visit her son Lamont, who was detained there several times, often for years at a time as he awaited trial. She says she received no special treatment as a former corrections officer. The film shows Drayton, her son — now out on parole and working to reintegrate himself into the community — and other family members at home making dinner. In an interview, she describes the day-long ordeal families go through to see their loved ones. And yet, “those visits are very important because it gives (detainees) a sense of being human because they’re not treated like human beings. They’re not,” she says emphatically. Drayton, who also worked at the Brooklyn Correctional Facility, strongly supports the effort to build smaller, more modern jails in the boroughs because they would provide more services and rehabilitative support to inmates. They also would enable families to more easily visit their loved ones. Though she left corrections more than two decades ago, Drayton used her experience to get a job as a campus security officer at CUNY’s City Tech in 1997. She held several other positions within the university before joining the J-School in May 2007, soon after its launch. 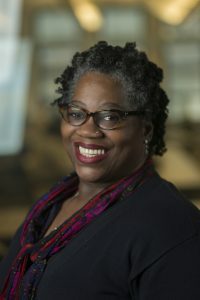 Drayton became the first female public safety director in the CUNY system when she was appointed to the position at Newmark J-School in October 2015. Since then, she has completed a bachelor’s degree in security management at CUNY’s John Jay College and is now pursuing a master’s degree in criminal justice. Her work at the J-School, while still in law enforcement, is “more about community policing,” Drayton says. And she says her years on Rikers Island informs her work with students.